Heeft u een vraag voor Dayunan El Nido Tourist Inn? Als u zoekt naar een gunstig gelegen hotel in Palawan, kijk dan niet verder dan het Dayunan El Nido Tourist Inn. Vanaf hier kunnen gasten genieten van eenvoudige toegang tot alles wat de levendige stad te bieden heeft. Dankzij de praktische locatie liggen alle belangrijke trekpleisters in de buurt van het hotel. Profiteer van de ongeëvenaarde dienstverlening en voorzieningen in dit hotel in Palawan. Het hotel heeft een uitgebreid aanbod aan services, inclusief 24-uurs receptie, wi-fi in openbare ruimtes, roomservice, familiekamer, tours. 12 kamers, verspreid over 3 verdiepingen, bieden een warme en plezierige atmosfeer met modern comfort zoals draadloos internet (gratis), niet-roken kamers, airconditioning, balkon/terras, televisie. Of u nu van fitness houdt of gewoon lekker wilt ontspannen na een drukke dag, het kan allemaal in dit hotel dankzij faciliteiten als massage. Het Dayunan El Nido Tourist Inn is een slimme keuze voor mensen die reizen naar Palawan: een ontspannen verblijf is gegarandeerd. De elektriciteit is niet beschikbaar van 06.00 AM tot 02.00 PM. In de stad zijn geen banken of pinautomaten. Kredietkaartfaciliteiten zijn op de meeste plaatsen niet beschikbaar. Voor eilandtrips wordt een ecotoerismetoeslag in rekening gebracht. Neem voor meer informatie contact op met de accommodatie. In sommige winkels kunnen buitenlandse valuta en reischeques in USD gewisseld worden. Vriendelijk personeel. Ontbijt goed geregeld. Alles schoon. Helaas was de kamer beneden heel krap. Kamers boven waren fatsoenlijk. Upgrade was helaas niet mogelijk. Op geen enkele site duidelijkheid over de kamers. Ik had waarschijnlijk pech. Daarom geen 5 sterren. Prima lokatie, alles op loopafstand. The place is clean and near the port and other places where you can dine or shop for souvenirs. The staff is very friendly and helpful. I recommend to look for ms. Chris if you want a hassle free vacation. She arranged our bookings for van transfer and island tours. She even gave us a discount. We enjoyed our stay there. A nice basic accommodation with a free breakfast. The room had a super small shower, but was clean and had a view of the bay. The hotel is near the ferry terminal, but far enough from the center of town that it's nice and quiet at night. Breakfast is served on the rooftop terrace that has a great view. The staff were all very friendly. The locatioin of this hotel is hidden by the main road, but most of the tricycle familiar with this hotel, just a short walk through the wooden path way from Milangrace Inn. This location is in the town proper, convenience place to go for island hopping, food and easily get the transfort to go amy where, tje price depend on your bargain skill. I love the roof top, nice place to relax and the view is amazing. This area also canget hot and cold drinking water, only simple breakfast is available, out of 3 choices, I prefer pancake and fruit I will stay again if I come to El Nido for holidays because the only cons is that the tap water not clean and the water pressure is low. Stayed here one night when we were unable to extend our stay in the ‘original’ hotel. Wish we’d been here longer! Located right next to the port, so you hear the boats from about 6am (if you are a light sleeper), but friendly, helpful staff. A decent room, for the price, and a lovely chilled roof terrace with comfy seats. A great place to hang out when you don’t want to be in town. Clean, basic, budget accommodation, but recommended if that is what you are looking for. Everything was ok. Breakfast was good but could be better if they offered garlic rice. Lady at the front desk is helpful and gracious. Rooms facing the beach are okay, they have a mini balcony. just don’t look on the left side- (canal and shanty looking houses) Room needs a little improvement but overall with the location and the price it’s pretty acceptable. a plus is their rooftop- nice place to chill and eat and use their wifi - this is the only area and their lobby that has Wifi. No wifi inside the rooms. I stayed here with my wife, niece & mother. We loved it. The staff are excellent & very friendly. The rooms are clean & have hot showers. The WiFi is only available in the lobby, but they have seats where you can chill & hangout. The hotel sells beer & softdrinks with is handy. There’s a sari sari on the wooden bridge to the place too, which you can get a lot of items from. The roof is a great place to chill here. You can see all the boats parked up. They have pizza you can order which we really enjoyed- they are good quality- they’re like stone baked or something, with really fresh ingredients. Essentially it’s the best pizza I’ve had in the PH the last 1.5 years- make sure you try one. You get a discount booking tours with the hotel. We took tour A using them. The location is right on the main beach, so getting up & out for a boat tour is really easy. The hotel prepare your breakfast for you & make sure it’s ready for your specified time. There’s an atm walking distance from the hotel too, which came in very useful. I will 100% recommend this place to all my friends. For the price it’s extremely good value. I recommend to any of you reading this- go ahead & book. I also want to thank the staff for a very enjoyable stay- Salamat guys! Place is clean. Its small but its clean. Staffs are very kind and friendly and attends to our requests asap. This is a Beachfront property but please take note that there are numbers of boat infront BUT IT IS STILL WORTH THE PRICE. WE WILL GO BACK HERE DEFINITELY. Breakfast is also good. Place was near the boat port, very accessible to all the happenings in the beach. Great view of the sea...The staff were exceptionally helpful and courteous, esp Kris and Kim. The location is perfect. 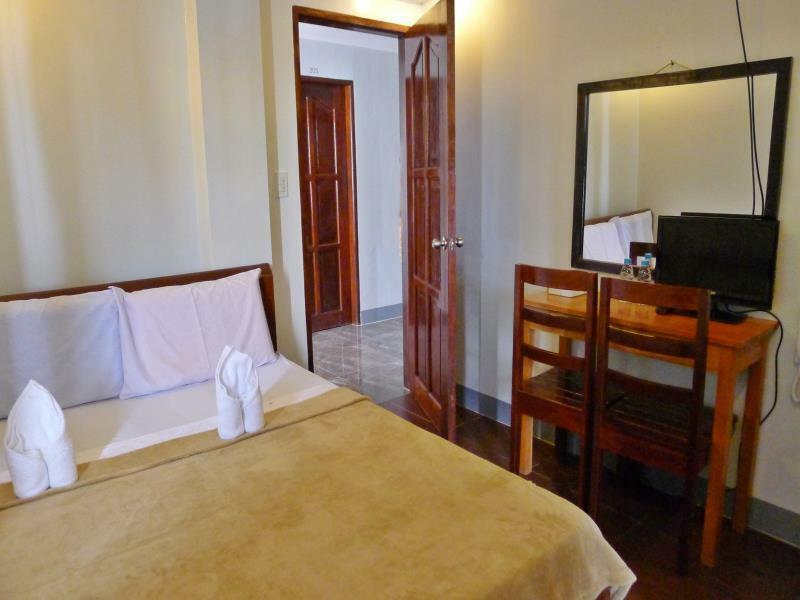 It has a picturesque view of the El Nido port and the rocky mountains. It is also a short walking distance to restaurants and souvenir shops. Lastly, the warmth of the staff is matched only by the clean, spacious and comfy rooms. The only thing good about this place is proximity to the tour pick up location. For the same hotel rate I recommend booking at the nearby Inn Joaquins bed and breakfast- they seem to have better facilities. Room they gave us has no window it was hard to dry off clothes we used for swimming. Since we were leaving at 6 am we asked if we could have our breakfast packed, they said no they only serve breakfast at 7am. There was also no power when we left at 6 am we had to use our cellphones’ flashlight mode so that we can pack our things in the room. We stayed there for 3 nights, the location is in town proper and close to pier, convenience to go for island hopping and plenty of restaurants within walking distance. The room quite comfortable and room service on request. The breakfast is simple with only 3 choices but dining place at the roof top is amazing. Other than the tap water not clean, we were happy to stay . We will chose to stay again if we come back for holidays next time. Stayed here with my wife, the staff always greeted us every time we went out. They booked tours A and C and paid the environmental fee for us, and there was no rush to pay them back, we paid for our tours after we went on them :). 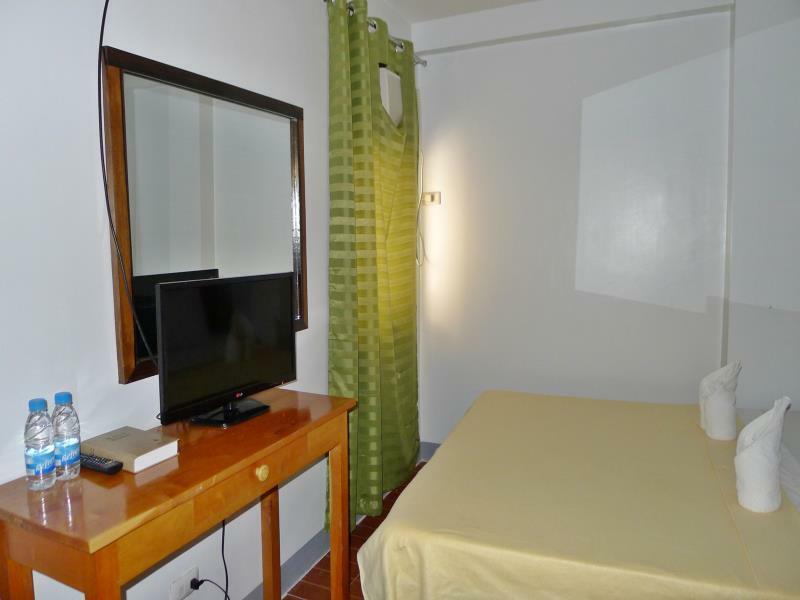 The hotel is small but accommodating, the immediate surroundings may not be the best but there is a fantastic view and the location is very strategic because its close to the BPI ATM/Bank and many restaurants by the shore. Would stay here again because its really affordable. It is just a budget hotel for sleeping. Pros : Staff - Good location for those who want go tours by boats - Breakfast - Value for money Cons : No elvator - small bath and narrow stairs - Smell from around area-Blackout is usual thing in whole El Nido but generators doing good.